May 9, 2011 - PRLog -- On Tuesday May 3, 2011, Dr. Todd Austin had the opportunity to teach 215 Sangamon County, IL 4 grade students (as well as 25 adults) about bats. Austin, a Chiropractic Physician from Virden and a current member of Hillsboro’s Montgomery County Toastmasters Club, has been an active member of Bat Conservation International (BCI) for over 20 years. During that time, ‘The Bat Doctor’ has spoken to 70 non-Toastmaster audiences throughout IL and educated over 3,900 people of all ages about bats. Austin was one of 36 presenters at the 2011 20th annual ‘Earth Stewardship Day’ event. This was an outdoor event put on by the IL EPA and held at the State Fairgrounds in Springfield, IL. All in all, Austin gave 7 separate bat talks during the event. Dr. Austin educated the 4th graders with his 15-minute presentation called “How to Become a Bat Ambassador” followed by a 5-minute question and answer session. Austin brought along 12 framed 8”x10” bat photos from his own volunteer work with bats along with a small jar of bat guano and a couple of actual bat houses (or bat boxes). The main points covered were how Big Brown Bats and Red Bats both help farmers by eating so many cucumber beetles and cut worm moths, and how Little Brown Bats help us all by eating so many mosquitoes, thus decreasing our chance of contracting the dreaded West Nile Virus. 1) Never disturb bats in their natural habitat. 2) Put up a bat house to provide an artificial roost for bats. 3) Help bats by helping BCI through the Adopt-a-Bat program. 4) Share with other people about how bats are beneficial to us all! "The kids especially liked the story that went along with the picture of Trouble, the big brown bat. A man from Springfield found ‘Trouble’ on his shower curtain one morning. Most boys thought it would be ‘cool’ to find a bat hanging from their shower curtain, while most girls said it would be ‘creepy’” said Austin. "And the boys were fascinated with the jar of bat guano, while the girls thought it was disgusting!”. "While I enjoy speaking to audiences of all ages," says Dr. Austin, "children are our planet’s future ambassadors. A little bit of knowledge at an early age can go a long way toward changing preconceived negative attitudes about these extremely important and highly beneficial flying mammals. The unfortunate truth is that with White Nose Syndrome now in our neighboring states of Indiana and Missouri, when these kids grow up, there might not even be any bats left in IL. We all need to act now and act swiftly to save and conserve our IL bats!" ‘The Bat Doctor’ can be contacted at draustin@royell.net or at: http://www.TheBatDoctor.net . Virden’s ‘Bat Doctor’ also left bat rings for every Sangamon County 4th grader that he helped to educate. 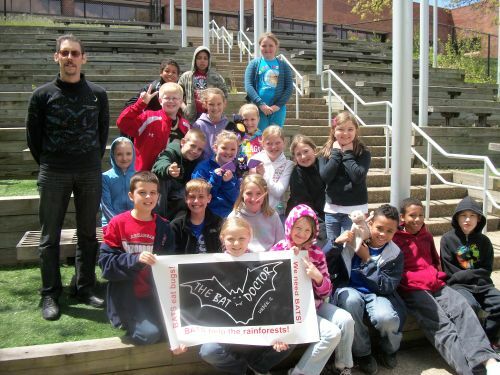 Photo caption: Dr. Austin with a class of Sangamon County 4th grade students on 5-3-11 at the IL Environmental Protection Agency’s ‘Earth Stewardship Day’ 2011.